Here are the results, replays, and photos from the seventh round of The Oppositelock Forza 7 Endurance Championship at the Nurburgring. In addition, the current points standings are in this post, as well as a few important notes for the next round in August. If you missed the race, check out the streaming list. All of the replays can be found there. Special thanks to everyone who streamed. A streamlined lobby setup and launch combined with a re-energized Sports - Proto class made for a great race! Another great race! There were battles start to finish. Some lasted the entire race. Even the Sports - Proto class proved to be exciting, with a new resurgence of drivers, new cars, and the biggest grid the class has seen since Daytona. Setup went great as well. Race was on time and had no major issues from a technical standpoint. The fact that it only ran 5 minutes past the targeted end time of 8 PM is pretty great considering all the problems we’ve had in the past. Very clean driving as well, for the most part. Only having two cautions on this track is pretty remarkable. Especially considering we were racing this close. Only small critique were some people issues which have already been discussed appropriately. ﻿After a number of technical issues and money shortages, the Alitalia-Lamborghini Racing Team missed most races of the season, making it in time for the toughest circuit this year, the Nordschleife. Against the best advice of team chief Timmo Chiefo, their only driver was hit with a bout of diarrhea after ordering the fish (and not the pasta) on their Alitalia flight from Milano to Frankfurt. Sick and understaffed, the team’s number 47 Miura was able to take a rather mediocre mid pack finishing position. Main team investor, Moni Mann, said the results were unsurprisingly disappointing. ﻿With the turn of the first half of the season Schnitzer Motorsports has had a successful season so far. Placing in the top 3 for all rounds things were looking good for the team with points to match the consistency. The 2.4 hours of Le Mans ended the streak when the Bmw 635 CSi suffered from electrical problems forcing the car to DNF on the 4th lap of the race. The team looked to their home track the Green Hell to finally get a win and make back points on the Scuderia OPPO Ferrari . The Bmw qualified on pole and lead the top half of the race until a safety car halted progress. 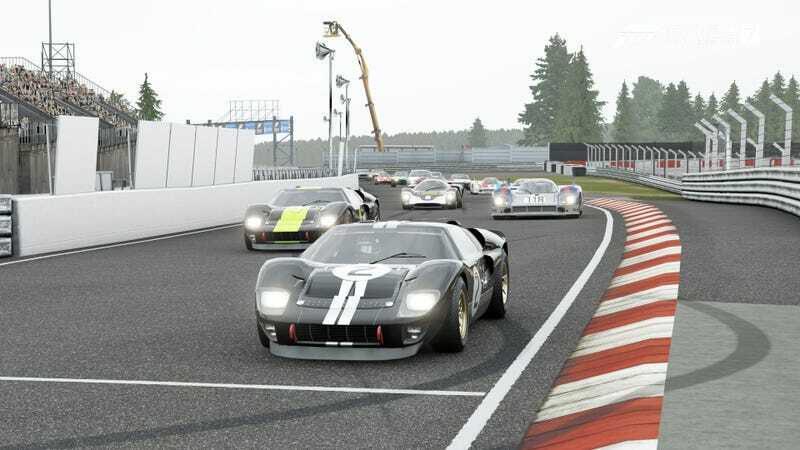 The car was forced to pit after the yellow flag was withdrawn letting the Ford Falcon of Divebomb Racing and the championship leading Ferrari by. The gap of roughly 20 seconds had been made up by the flying 635 and overtakes the Ferrari on the outside going into Bergwerk. Then charging ahead to catch up to the Falcon on the final lap closing the gap the closer the pair got to the checkered flag. After the Karussell the two are bumper to bumper until the Ford goes off at Stefan Bellof S allowing the Bmw to cruise home to victory. ﻿The Darkzer Falcon drove a perfect race, then someone spammed me on discord, i lost frames, and finished P2 instead of the win. ﻿Was driving. Suddenly was no longer driving. Went and had a beer. And now for the first time, we go to desu desu land Japan! Suzuka is next on the calendar. It’s been a long time since we have raced there. A very long time. Since Forza 4, actually. I personally love this track, so I’m really excited to see how these cars will run on it. We’ll have the possibility of a rain race too, so look for that in the voting so we can vote for real world conditions with the hope of rain only to race in the day for like the fifth time in a row. The voting thread for the date will be up very soon. Time options will still be very limited, what with RRIPA and NASCAR series currently ongoing on r/redditracing. BoP may or may not be changed very much. Not sure what all will change. Expecting something similar to Maple Valley because handling track but I don’t really know yet. Either way, BoP will be done a week before the next round at the latest. In addition, I’m going to be partially removing some cars from the BoP list for this round going forward. Any cars that have been rarely or never raced will not be BoP’d and put on a build-by-request status. They are still eligible, but you’ll need to tell me ahead of time if you want to drive it. This is just so I’m not killing myself over BoP anymore, especially with school starting up again soon. The voting for the first community choice race is also in the next sign up, so keep an eye out for that. Well past the halfway point now, and only 5 races to go. I have a feeling from here on out, the battles will only get better and better. See you at the next race!